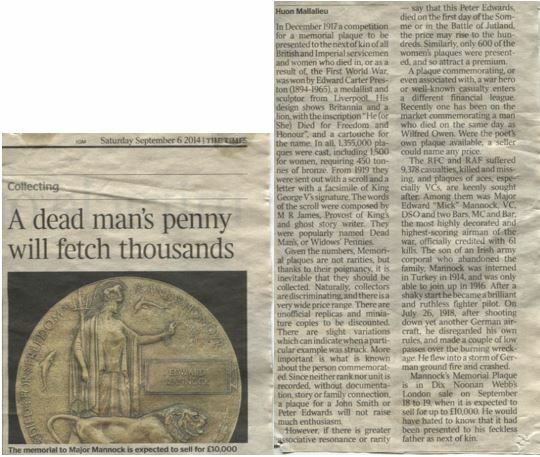 Some medals and a plaque (the Dead Man’s Penny) were discovered by Vernon and Pamela Brown when they were emptying their late mother’s house in Oswestry some 12 years ago. Vernon used an old remedy of ‘tomato sauce’ to clean the plaque, which revealed the name of John Sydney Williams. They knew then that the items didn’t belong to their family. Despite several attempts to locate the Williams family, they were unsuccessful until they donated the items to the West Felton Branch of the Royal British Legion, for their Centenary Commemorations. 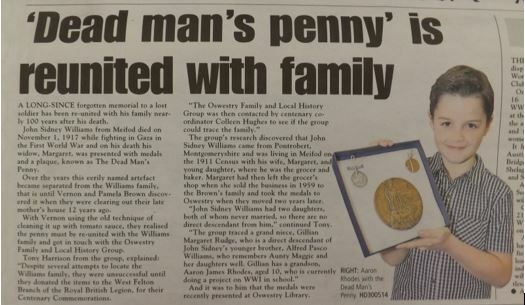 Oswestry Family & Local History Group was then contacted by Colleen Hughes (Centenary Co-Ordinator) to see if the Group could trace the family. The Group began researching and soon discovered that John Sydney Williams came from Pontrobert, Montgomeryshire and was living in Meifod on the 1911 Census with his wife, Margaret and young daughter, where he was the Grocer and Baker. 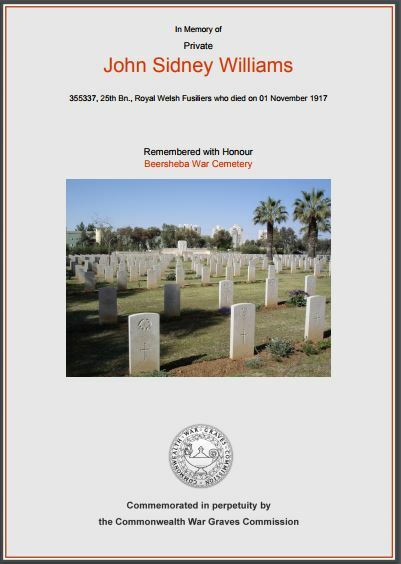 John Sydney died on 1st November 1917 and is buried in Beersheba War Cemetery, Gaza. Margaret, his widow, received the medals and plaque, but the items were left at the Grocer’s Shop, which she carried on running after his death, when she sold the business in 1959 to Pamela Brown’s family. When Pamela’s family moved to Oswestry in 1961 the items went with them. John Sydney Williams had 2 daughters, both of whom never married, so there are no direct descendants from him. 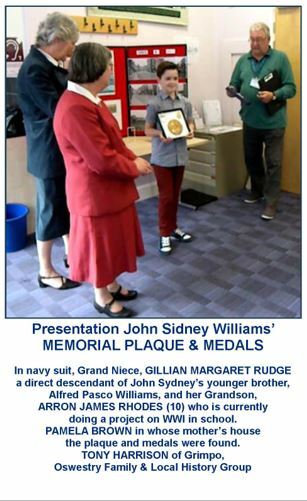 The Group has traced a Grand Niece, Gillian Margaret Rudge, who is a direct descendant of John Sydney’s younger brother, Alfred Pasco Williams, who remembers Aunty Maggie and her daughters well. 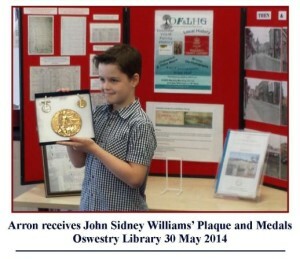 Gillian has a Grandson, Arron James Rhodes, aged 10 years old, who is currently doing a project on WWI in school. The Group decided that it would be nice if Pamela and Vernon could present Arron with the medals and the plaque. The Group have also produced a framed Relationship Chart for Arron, which will be given to him at the ceremony, which will take place at 14:00 in Oswestry Library on 30th May 2014.
to find out more about John Sidney. 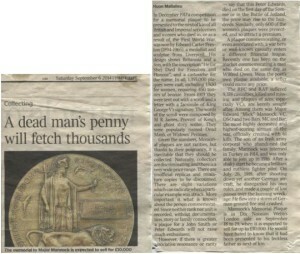 Thanks to friends in West Felton he is honoured here today and the medals and plaque have been passed on to a gt.gt.gt. nephew.